Reader on the 6.27 is the perfect book for book clubs, and we've created questions to help get your discussion going. We've chosen some brilliant new novels perfect for book clubs and created questions to help get your discussion going. 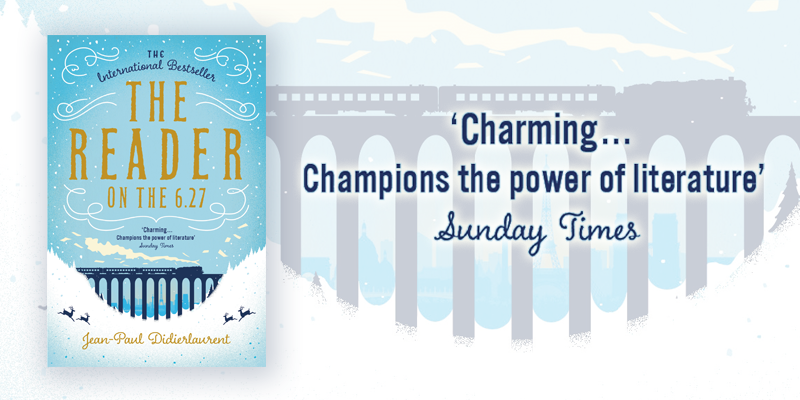 The Reader on the 6.27 by Jean-Paul Didierlaurent is a warm, funny story about the redemptive power of literature, perfect for book-lovers everywhere. Sitting on the 6.27 train each day, Guylain recites aloud from pages he has saved from the jaws of his monstrous pulping machine. But it is when he discovers the diary of a lonely young woman, Julie - a woman who feels as lost in the world as he does - that his journey will truly begin. Here's some questions about The Reader on the 6.27 that you might like to discuss with your book group. 1. From an alexandrine-loving security guard to a man searching for his legs, the characters in The Reader on the 6.27 are all larger than life. Did you feel you could still relate to them? In what way? Were there any characters you were particularly fond of? 2. Guylain begins the novel in a woeful state. Why do you think he has endured the misery of his job for so long? What did you see as the turning point for his luck? 3. In many ways The Reader on the 6.27 defies genre, but there are traits of romance, fairy tales and adventure. If you had to place this novel in a genre, where would you say it lies? Did the book go where you were expecting it to? 4. After finding Julie’s diary, Guylain stays up all night reading every last entry. What do you think draws Guylain to the mysterious diary author? 5. From love to legs, all of the characters are seeking something that is missing from their lives. Was there a particular storyline you enjoyed the most? Do you think they all found what they were looking for? 6. You could say all of the main characters end up happy in their own way. Do you agree that this is the case? How do you feel about a book that ends ‘happily ever after’? 7. Guylain reads a wide range of extracts aloud to his listeners. Were there any book extracts that really stood out to you? Why do you think particular ones were chosen by the author? What did they bring to the story? 8. We only get to know Julie through her diary entries. How do you think that affected our view of her? Did you think she was a good match for Guylain? 9. Did the novel remind you of any other books or films? What did The Reader on the 6.27 have in common with them? And what made it different? Reader on the 6.27 is out now in Paperback and as an Ebook and Audiobook.